We all know that BMW is preparing to launch the M8, which will take its place at the top of the 8 Series range. 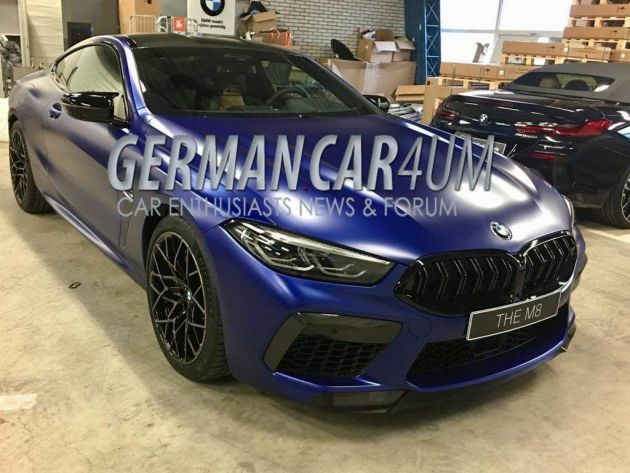 Now, leaked photos posted on GermanCarForum reveal that an even hotter Competition version of the M8 is on its way to occupy that space. The M8 Competition follows in the footsteps of models like the M5 Competition and M2 Competition, offering even better performance in addition to better aesthetics. In the case of the former, it is expected that the S63B44T4 4.4 litre twin-turbocharged V8 from the latest M5 will be employed, albeit tuned to produce more power. Rumours point towards a peak output of 650 PS for the M8 Competition, while the vanilla M8 is said to get just 630 PS. It shouldn’t come as much of a surprise that the M8 Competition will be the quicker of the two in the well-known zero to 100 km/h sprint. On the exterior, the M8 Competition comes with quad exhaust tips as seen on other full-blooded M cars, along with an increased use of carbon-fibre on the side mirror caps, bumpers and trunk lid spoiler. The carbon-fibre roof that is optional on the normal 8 Series is a standard fitment here along with model-specific alloy wheels and black accent trim. Other details include carbon-fibre trim on the centre console on the inside, badged sport seats with a patterned backrest, Competition badging, M-branded gear lever and a leather steering wheel (Alcantara should be an option). So far, the 8 Series line-up includes both the Coupe and Cabriolet models, both offered in M850i xDrive and 840d xDrive guises. A Gran Coupe model is also in the works, but it remains to be seen if BMW will give each body type the full M treatment beyond just the coupe. There’s a 8er cabriolet and the new G20 seen in this garage…perhaps the 8GC is lurking somewhere in the same place too.